The crossing over to the Isle of Scilly on the Scillion can sometimes award you with some good views of seabirds and on the 3rd August i was lucky enough to see 7 European Storm Petrels , 500+ Manx Shearwaters, 100+ Shag & 1 Great Skua , Fulmar & Gannet were also seen in good numbers plus we saw 20+ Common Dolphin which is always a magical sight. After booking into the Bell Rock Hotel it was not long before we headed down to the quay for our 1st pelagic on the Sapphire with expert skipper Joe Pender & expert guides Bob Flood & Jason Moss. The journey out of St.Mary's harbour was pretty non eventful but it was not long before we had a good selection of Gulls following the boat , these included Herring Gull , Lesser black backed Gull & Great black backed Gull , however we soon got superb views of two Juv Yellow legged Gulls. We had good numbers of European Storm Petrel (40+) and Manx Shearwater (20+), there was also a constant stream of both Gannet & Fulmar (often following the boat). Then the shout went up from Jason , ' get on this Petrel' , we did and although distant you could clearly see it was a Wilson's Storm Petrel which was soon joined by a European Storm Petrel and size & flight comparisons could be made. I have seen 4 Wilson's Storm Petrels before but many years ago and the views of this bird were of similar distance , there was a buzz on the boat as this was a new bird for many including RR, however a bit later in the pelagic we once again saw a 2nd Wilson's Storm Petrel but this time it was flying towards the boat and just kept on coming !!!! 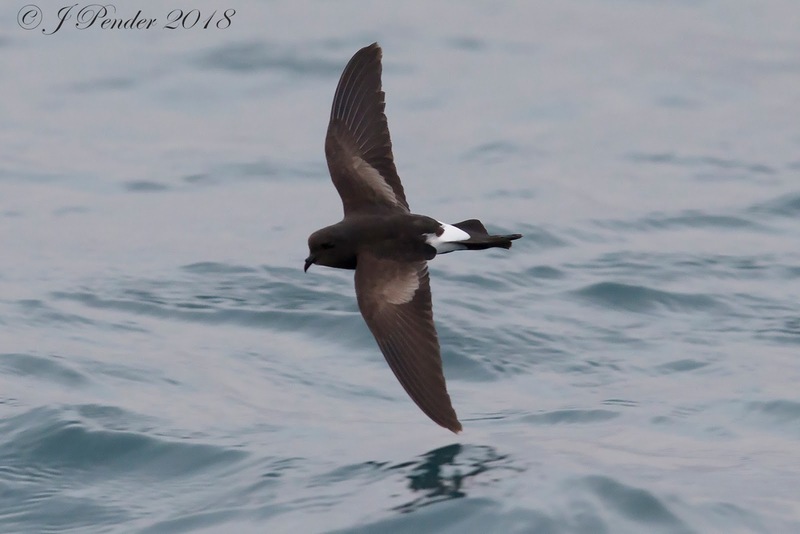 At one point it was so close i could see it's eyes , my photos were hopeless but skipper Joe Pender managed to get some fantastic photos (see above) many thanks for the use of your photo's. 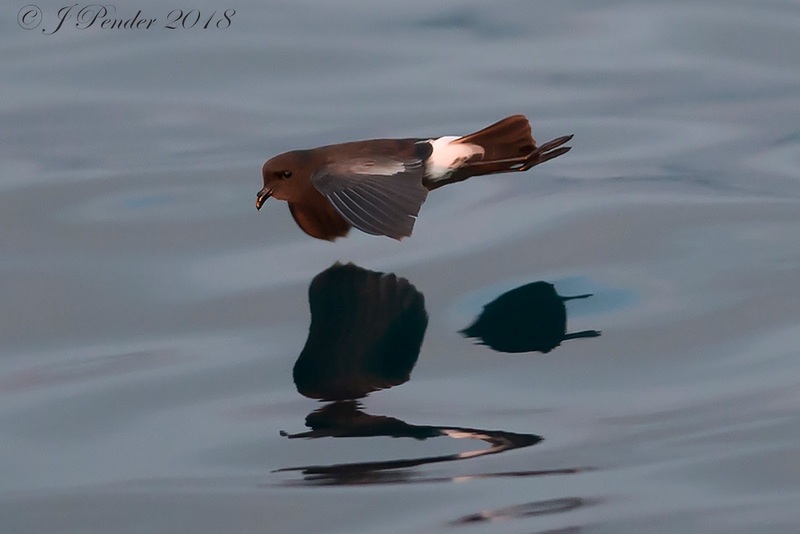 This was my 6th Wilson's Storm Petrel (2 on this trip) but by far the best views i have ever had of this rare seabird, wow what an experience. We also saw 100+ Common Dolphin and a Blue Shark which was a new species for me. Today was an all day Pelagic however with dead calm seas i thought we would be very lucky to see anything , however we did our best and had absolutely fantastic views of Gannet & Fulmar. We did see 3+ European Storm Petrels and 100+ Manx Shearwaters , a single Sooty Shearwater was great to see and then the shout went up ' Great Shearwater ' we all got onto the bird but sadly it didn't come in to check us out despite the chumming that had been going on all morning. We saw a 2nd Great Shearwater a bit later on in the day but that just kept going , however we kept at it and enjoyed watching 50+ Common Dolphin , 10+ Porpoise, 50+ Grey Seals and a real bonus a Minkie Whale. This was our last day and we had high hopes for abit more action compared to yesterday , the sea was still calm but there was more of a breeze than yesterday. We were not long out of St.Mary's harbour when we had great views of a Kittiwake. We then saw a large raft of Manx Shearwaters and had some superb views of these cracking Shearwaters. Once again we had the constant company of Gulls , Gannets & Fulmars following the boat which afforded some great photo opportunity's. Common & Sandwich Terns were seen and a trickle of Kittiwakes appeared here & there , European Storm Petrel (20+) were seen but never came really close enough to get a photo. A real surprise was a Porbeagle Shark which was new for me , another Blue Shark was seen , plenty of Sunfish (5+) and lot's of Compass Jellyfish. Then we struck really lucky when a Great Shearwater came in to investigate all the action in the wake of the boat and we had some fantastic stunning views of this wonderful bird. I have seen many Great Shearwaters in the past and had good views of them , however these views are the best i have ever had , you could see every detail and listening to Bob Flood describe how to age the bird (this bird is a juvenile) and where it was born was a real education. We had distant views of 2 Sooty Shearwaters and another Great Skua showed really well, our last bird of the trip was a critically endangered Balearic Shearwater which was to quick for me to get a photo. Here is a selection of photo's of some of the other wildlife i saw on these superb Sapphire Pelagic's.